Peanut corn chip candy. Egg custard dim sum. Dessert pizza. They may sound like strange concoctions, but they are mouth-watering delicious. 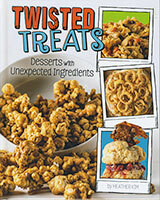 Some ingredients you may never have dreamed of baking with but come together for the perfect combination of flavors. Easy, step-by-step instructions provide for fun in the kitchen and beautiful, pleasing results.